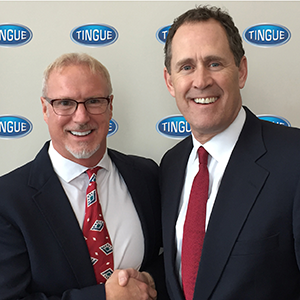 Global laundry product supplier Tingue has named Ty Acton president. Promoted from VP Sales by CEO David Tingue, Acton is responsible for implementing the company's overall strategic direction, driving its sales strategy and leading the 4th-generation, family-owned organization founded in 1902 on a global expansion that already encompasses operating businesses in the United States, Canada, Asia and Latin America. Accepting the responsibilities previously held by David Tingue, Acton plans to continue growing and exporting the Tingue brand and its products and services while remaining steadfastly committed to both customer and employee satisfaction and retention. The company offers a line of premium quality supplies for flatwork ironers, feeders and folders; rebuilt ironers; laundry carts; rigging and repair services; and replacement parts and accessories for all laundry equipment makes and models. It does so with a team of expert, field sales representatives to help laundries meet demanding quality and production standards as safely and efficiently as possible. For more information, contact David Tingue, CEO, The Tingue Family of Companies; 10024 Skokie Blvd., Ste 315/317, Skokie, IL 60077 USA; 224.233.1030; www.Tingue.com.